The Pistons started off November with a 117-109 win against the Wizards at The Palace thanks to Sheed, Richard Hamilton and the clutch play of fan favorite Walter Herrmann. Even though the season is in its infancy Detroit’s two victories give them a nice cushion as with some tough road trips coming up. The Palace had quite a different atmosphere in comparison to Wednesday night’s opening. The crowd was really into the game, it could have been the fact that it was Kids Night, or the flow of the game, but if I had to put my money on it I would say it was Walter. The Walter Herrmann chant from the crowd late in the fourth was great. Curry scored a point with me by leaving the hot Walter on the floor the whole fourth quarter when he was getting the job done. Last season that wouldn’t have happened. Herrmann mystified the crowd with this hustle, circus shots and clutch three pointers. Herrmann finished the game with 16 points off the bench with 7 boards, 4 assists and a steal and the play of the game. Walter Herrmann’s highlights. I think a ton of people have jumped on his bandwagon already, and you can’t really blame them after his showing the past two games. Put Hermmann in the rotation last season and who knows what could have happened in the playoffs. Walter Herrmann’s post game interview. The Wizards’ Nick Young (taken right after Rodney Stuckey in the 2007 NBA Draft) put up 23 off the bench and looked great. Stuckey on the other had 11 points for Detroit. The Wiz are happy with their pick and we all know how Detroit and the rest of the league feels about Stuck. Well drafted for both teams. Detroit shot 53.2% to Washington’s 51.9%. It was a high scoring fun game to watch except when Detroit squandered two 17 point leads in the first half letting Washington hang around all game long. Detroit owned the boards ripping down 49 to The Wizards 24. Rasheed was a monster putting up his first (of many I hope) double-doubles of the season. The man was dangerously close to a triple double with 17 points, 12 rebounds, 2 assists, a steal and 6 blocked shots. The man just couldn’t be stopped. Poor Songaila, Ra stuffed him every chance he could. That’s got to do something to a baller’s confidence level. Like I said, couldn’t be stopped. I don’t know if Curry is going to make it a habit, but he played 11 players again on Saturday. Huge bench numbers, Detroit’s bench put up 55 points. Deep. As for the big lead the Pistons squandered, they went on one of “those” droughts that we all hate. Detroit handed the Wizards the entire lead plus some in the closing minutes of the second quarter. They went six minutes without a field goal and made six turnovers. Miserable to watch. Amir and Stuckey both got into foul trouble. Amir logged just 10 minutes with five fouls and 2 points. Chauncey struggled with his shot going just 2-for-8 but made all 10 for his free throws allowing him to finish the game with 12 points and 8 assists. It was almost a multiple double-double Piston night. Maxiell’s teammates need food. Maxiell meanwhile put up 11 with 7 boards in just 16. My new friend Kwame Brown inked his first points as a Piston, going 4-for-4 for 8 points and a board against the team that drafted him. Rip led the Pistons with 24 points on 9-21 shooting with 7 boards and 3 assists. Looks like Rip wants to remain the Pistons leading scorer this season. No matter what Affllalo does he make good with his time. Three minutes, three points. Detroit is lucky to come away with the win after turning the ball over 17 times. Good thing they owned the boards. Glad to see the Chat Room is a hit. Detroit hits the road for three games at Charlotte, Toronto and New Jersey. The Pistons start with the Bobcats on Monday. Next home game….The Celtics on Sunday! 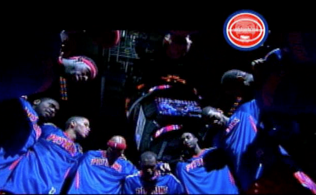 The Pistons vs. The Wizards Billups for Iverson? 15 Responses to "Wins, Wizards and Walter"
FLIP SAUNDERS IS GONE BECAUSE HERMANN IS PLAYING!! !i always said hermann not hayes..flip is a joke now ull see why. It was huge performance Walter Herrmann coming in from the bench. I’m happy to see that he is finally being given a shot by the Pistons. I wish we had him with us during Beijing. But his decision to stay back has paid dividend for him after all. All his hard work and effort to win himself a place in Pistons roster is fullfill. I hope the new coach will keep this up. I’m hoping to see his contribution will help the franchise is someways to regain back their dominance in the East. What a bench! Nice win, now let’s hope MC’s message about playing D for every minutes start to finish doesn’t get lost or else we’ll be in trouble vs real offensive teams. Still cool to get two home wins before hitting the road and play real contenders. I hope Amir’s confidence is not too shaken, he really looked confused out there after he picked up two quick fouls. He’s so intense and so athletic that he doesn’t seem to be able to shift gears when he needs to back off some, it’s all or nothing, has to learn to pace himself. Good game last night for the Pistons. Being away in Mount Pleasant, this was the first game of the year I’ve been able to go to. Aside from that, the big story. Walter Herrmann. The man with unbelievable hands and a great skill set was able to finally make his mark as a Piston. It was awe-inspiring seeing him have that much confidence, as well as the team having so much confidence in him. Definitely a huge plus. Another note. Amir Johnson with 5 fouls? shoot. All these little ticky-tack fouls the refs called last night, couldnt see my favorite player. He had a very tough assignment guarding Jamison. The coaches wanted to see how he would react to such a great player. I feel he played well in his minutes, but his point total/ foul total make it seem otherwise. Anyone who was at the game notice this one… Is the consecutive sell out streak over??? Every home game I’ve been to, they put another number on the consecutive sell out list. (I believe its at 239? )Just a random thing I noticed. 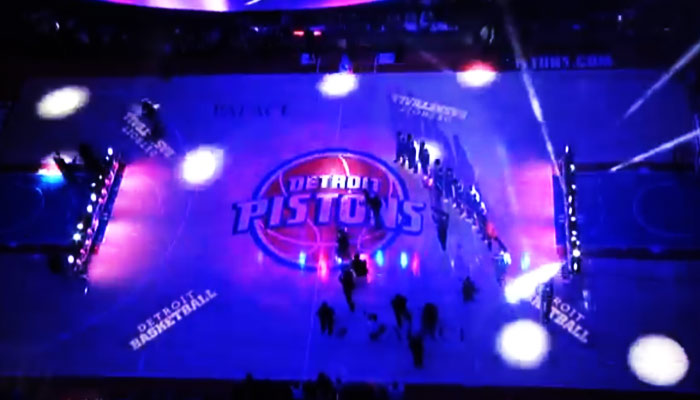 Pistons season time once again! Well they don’t always put the new number up, I’ve been to tons of games. It was a good game, but it irks me that they were stepping on the wizrads throats, and let them up, take teh lead, and score over 100 points. They need to get these teams down, and knock them right out. Based on his preseason play (albeit limited preseason play), I thought Herrmann should have secured the small forward spot. In games last year where Jarvis Hayes actually shot the 3-ball well, we blew teams out. He just wasn’t consistent enough and I think Herrmann can bring that consistency as well as the other intangibles he brings. Amir had a rough game, but I expected it. Washington is a tough matchup for him. They have beef on their frontline when healthy in the form of Etan Thomas and Brendan Haywood. Skills wise, Amir matches up better with them, but they would probably be too strong for him. I actually thought he did pretty well guarding Jamison, who is a tough cover for anyone. Jamison’s game seems to be predicated on making difficult shots. He has always caused problems for any Piston defenders, not just Amir. The majority of Amir’s fouls, however, came on the offensive side. I’m sure the coaching staff will work with him on that. It’s not like Johnson is leaving us hanging, after all. We have a deep team so he can go all out because the guys on the bench can pick up the slack. In regard to Fluidics, I didn’t really see it that way. First off, kudos to the starters for really coming out focused and energetic. The bench didn’t seem to start off with the same energy they usually bring, but they still acquitted themselves well. Kwame made some nice plays, but there are still things he needs to clean up which will come with time and familiarity to our system, I think. 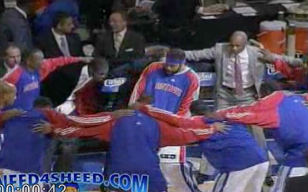 What it seems to me is that the Pistons are showing they are grasping Curry’s offense. What happened, however, is that Washington upped the defensive intensity. So initially, you had the Pistons running the offense to perfection but then Washington began taking away the first options in the offense. The Pistons then struggled with the second and third options which led to turnovers. What this means is it’s a work in progress. So long as I see continued growth, I will be a very happy camper. Our defense needs to improve, 109 points for the Wizards? That can’t happen against better teams. Walter was so fun to watch on offense, like the Hated Steve said, we all were thinking Herrmann should have been moved up over Hayes. And you’re right Natalie no way would Walter have been out there last year. But he has to improve on defense, especially on the pick and roll. He can’t just leave his guy every time. But I think they can improve that. Kwame Brown is FAST! Now I understand what Dave Cowens was talking about. Sheed was a beast, but he’s gotta get himself easier shots to make, he can’t shoot contested turnaround fade away shots all the time and expect to make them. But those 6 blocks were awesome. I’m glad they were getting shots for RIP he does so much work he’s earned his shots, we didn’t really feature him last game. Who the heck were the fans that left in the forth? I didn’t say nothing about the Indiana game when they left but this was a great game to watch and I’m sure play, why would they leave early? And where’s the chat room? Two big games from Walter already this season. I (and many others) expected Detroit’s bench to step it up this season but I didn’t think it would come from Walter! But it’s great that he’s playing well. Good to know we finally have a servicable backup for Prince at the 3-spot. Hayes was ok but too 1-dimensional. Walter is like… 7-dimensional! I didn’t get to see the game but how did Kwame go? American Prince- I disagree with your comment about Rasheed. I love when he’s down low taking those turnaround faders in the post- they’re very high percentage shots for him, and I think most of us can agree we prefer seeing him doing work down low. American Prince – Valid point! But i would still settle for those contested-turn-around-fade-away-base-line shots rather than the three pointers he usually takes (and often misses). If you noticed yesterday, the wiz were sending double teams at him and he would take the shot. What that shot could create is a free piston to crash the boards. I think that opened up a lot of offensive rebound opportunities, which i believe contributed to our winning of the offensive boards, 16-5. I agree he should have at least two more post moves aside from that that he should use, so that the opposing teams would be kept guessing. I suggest he try using Tim Duncan’s baby hook and bank shot or karl malones fade-away shot from the free throw elbow. On a final note, he should leave the three pointers to Rip and Rico Suave.